As more and more wines are bottled in screwcaps, the broader wine industry is seeking ways to replace or recreate the ritual of opening a cork-closed bottle of wine. 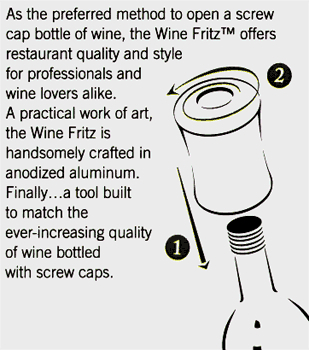 Alongside is information about one solution, the Wine Fritz which was developed in the United States and is placed over the screwcap and then opens it with a twist. I know that the Wine Fritz has mixed results with some hating it. Regardless of whether you like it or not, it shows how people are trying to replace the ritual of the pulled cork. A couple of years ago, I was in Napa Valley and screwcaps were just emerging onto the market. I remember the sommelier’s solution to the screwcap was to twirl around, opening the screwcap during the twirl. Guess we have a way to go to find the replacement ritual.